Acting Peace Corps Director Carrie Hessler-Radelet awarded Macalester for placing third on a list of top volunteer-producing small American colleges. Photo by Heather Johansen ’16. This visit honored Macalester for moving up 15 spots to third place on the Peace Corps’ annual list of top volunteer-producing small colleges and universities (under 5,000 students) across the country. Sixteen alumni currently serve in the Peace Corps, and this is the ninth consecutive year that Macalester has earned a spot on the list. 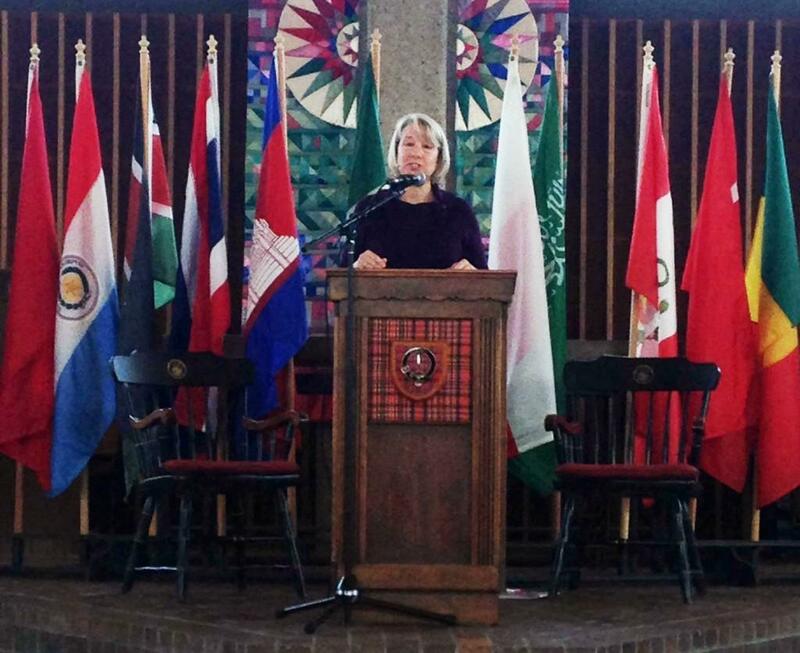 “Macalester deeply honors the issues that tie us all together: internationalism, multiculturalism and general respect for one another,” Hessler-Radelet said. Including the 16 currently serving, 356 Macalester alumni have served in the Peace Corps since the advent of the program in 1961. This year, 20 Macalester student applications are being processed. During the visit, Rosenberg spoke of Minnesota’s character as imperative to the recruitment of new volunteers. She also discussed the thorough training all volunteers receive. “Volunteers are not just making a difference on the ground. They are learning to navigate cross-cultural divides and see the world not as it is, but as how it could be,” Hessler-Radelet said. She then discussed how Peace Corps work serves as a launchpad for a 21st-century career. “Peace Corps volunteers are innovators, thinkers, and open to new perspectives, and these are the skills that corporations want,” Hessler-Radelet said. “We want ideas that make a difference, which is really what Macalester is all about,” Hessler-Radelet said. Four generations of Hessler-Radelet’s family have served as Peace Corps volunteers. She herself served in Samoa from 1981 to 1983 as a teacher. Upon returning she devoted her career to public health work focused on HIV/AIDS and maternal/child health, and has more than two decades of experience on such public health issues. After her planned presentation in which she discussed the benefits of the Peace Corps, Hessler-Radelet opened up the floor for questions. One guest asked a question about female volunteers’ health and security, which prompted her to address dangers and gender inequalities that volunteers face abroad. “The role of women is a big issue. Gender inequality is a big role in other countries and our own country. But in every place there are different perceptions of women,” she said. Hessler-Radelet is familiar with this topic, having initiated a comprehensive assessment and reform to improve the efficiency and efficacy of the organization after joining in 2010. She has overseen policy reform to improve the safety and health of volunteers by implementing programs to reduce the risk of sexual assault and violent crime as well as improving medical, mental and legal post-service care for victims. “There are risks … it’s been quite public. It’s no surprise that there have been issues of sexual assault, but we’re working on training volunteers to be as prepared as possible. We want to prevent sexual assault when we can, while always recognizing that assault is solely the fault of the perpetrator,” Hessler-Radelet said. Ben Lavin ’14 attended the event and listened with a special interest towards advice for participants. Lavin recently received notification that he was accepted into the Peace Corps and will depart for Benin on June 23 to serve as an economic development advisor. He will be assisting communities with their needs through supporting businesses and teaching money management and accounting. “[I was] really impressed by the stories she told and how Peace Corps can play a positive role towards members of a community. 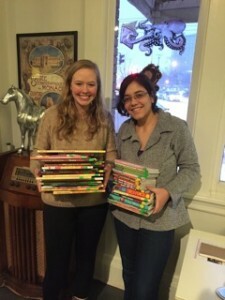 I also found it interesting to interact with returned volunteers who had gone in the 1960s and had really no connection to home during their time in the Peace Corps,” Lavin wrote. Lavin first considered the idea of serving after attending a panel at Macalester in 2011, in his sophomore year, that reflected on the then-50th anniversary of the US Peace Corps service. “Through my classes and my interactions with students I became really interested in development. This led to involvement and eventually becoming a co-chair of the Macalester Development Group. This combined with studying abroad in Hyderabad, India has made Peace Corps a natural progression,” Lavin wrote. Hessler-Radelet also spoke about the efficiency of the constantly modernizing application process. “We are trying to reduce an eight hour application to a one hour application to streamline the process…we are modernizing. As the work of the Peace Corps evolves, so will the application,” she said. The newer features of the application also include a larger preference allotted for location selection, which has been working out so far. As for advice to those considering serving or about to head off, returnees suggested learning from others’ experiences. Which is not difficult in the Twin Cities. As returnee Rhoda Brooks mentioned, there are over 500 members in the return Peace Corps Volunteer Minnesota group. “Maybe next year I will be back at this podium, and Macalester will be in the number one spot.” Hessler-Radelet said. “Macalester has a strong ethos on service and a complex international outlook. I know just driving by, the first thing you see is the Institute for Global Citizenship, and I have never seen anything like it anywhere else. You have tremendous faculty and a supportive administration that reinforces the Peace Corps values.” Hessler-Radelet said. “And in general, there is something about Minneapolis and St. Paul that is giving in nature, and very open and welcoming and it’s clearly present in the cities and at Macalester.